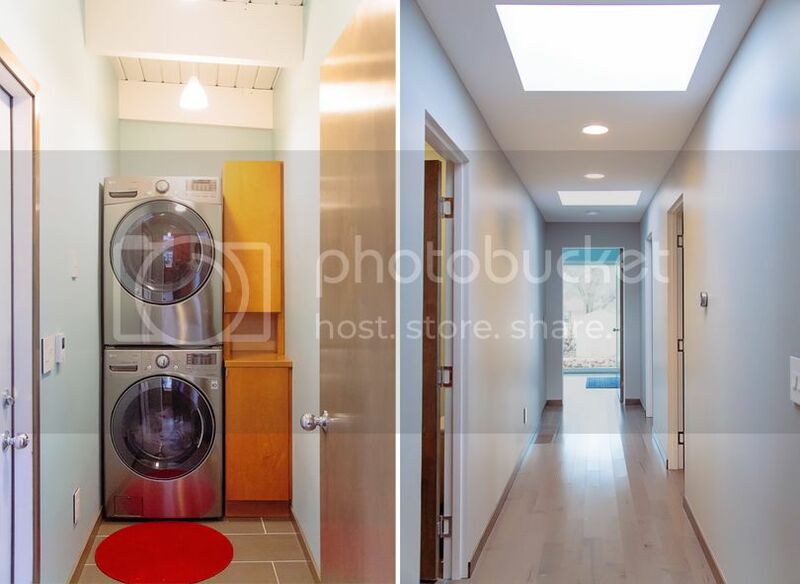 When we bought the house, the laundry room was part of the hallway bathroom, which didn't make sense to me (and wouldn't pass code these days anyway...) You can see the original inspiration for this room here. After reading thru the post I wrote a year ago, I obviously changed my mind a lot! Since the photos were taken by K. Holly, we've hung a few prints in this room, along with some IKEA hooks for coats, hats and bags. It's much more "winterized" for us in Michigan - there are coats, hats, & boots everywhere! Since the room was part of the garage, and sits on a cement slab, we did heat the tile floor - which we LOVE! Even though the room is quite tiny, it works for me to wash/dry and then take to the kitchen island to fold and then to bedrooms to put away. There is no room for dirty baskets, so we simply have hampers in our closets. You may notice we don't have any trim on these interior doors. Greg came across EZY Jamb and wanted these so we'd reduce visual clutter in our hallway. I am very happy with how it looks, and they have held up so far - time will tell for how long! We opted for no visible light fixtures in the hallway - we wanted to keep it as plain as possible. No photos/artwork planned for here either. I've been looking for Ezy jamb distributor in MI. I'm in Lansing. Who did you use?